It's Thanksgiving! It's too bad this post couldn't be posted in November but that's the way the ball bounces. 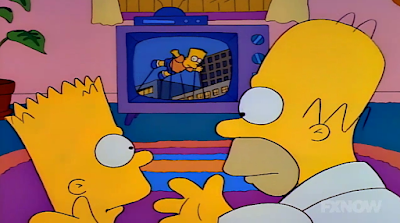 Anyway, Homer is watching a football game while Marge is making Thanksgiving dinner and Bart and Lisa are arguing over glue. Lisa needs the glue to finish her Thanksgiving centerpiece which is a tribute to all the women who made our country great. 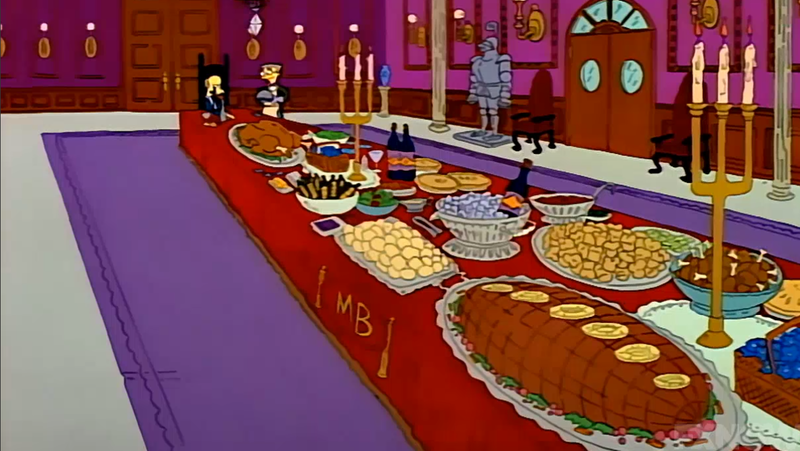 Family starts arriving, complete with Patty and Selma bringing food despite Marge making dinner. Homer leaves to pick up Grandpa and Jacqueline, Marge's mother, shows up and only criticizes Marge. Dinner starts and Lisa brings out her centerpiece which everyone is impressed with. 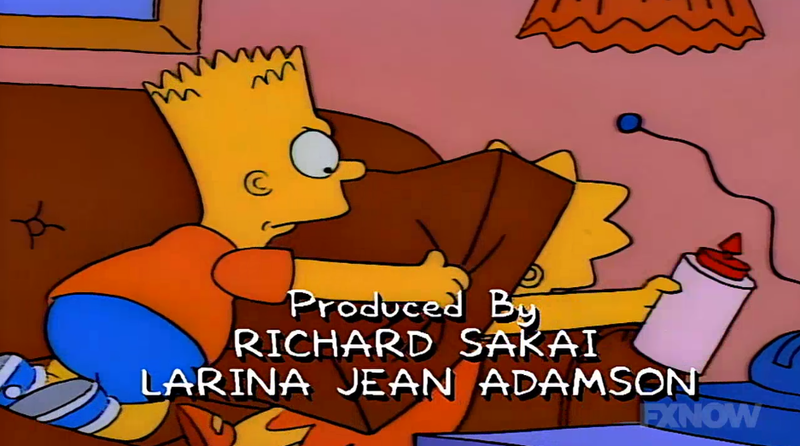 But Bart, who is bringing out the turkey, is not. After a brief fight, the centerpiece winds up in the fireplace and burnt to ashes. Lisa runs up to her room, crying, while Bart doesn't care. Homer and Marge send Bart up to his room without dinner telling him that "He's ruined Thanksgiving." Marge says that Bart can come downstairs when he apologizes to Lisa. Bart refuses arguing that he has done nothing wrong and runs away with Santa's Little Helper. They arrive at Burns Manor where Bart tries to steal an apple pie cooling on the window sill. Burns releases the hounds and Bart and Santa's Little Helper end up on the wrong side of the tracks where Bart sells his blood for $12. Because Bart hasn't eaten all day, he passes out in the gutter after giving blood. 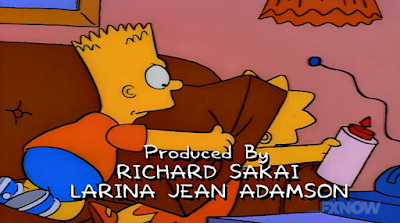 Two bums wake Bart up and take him to the rescue mission to get some food. While at the Mission, Kent Brockman is doing a report on homelessness and interviews Bart. He's noticed on TV by his family who call the police to find him but don't. Bart realizes that being homeless isn't what it's cracked up to be and reluctantly returns home but refuses to go inside, climbing on the roof instead. He calls Lisa up on the roof and she asks why he burned her centerpiece. 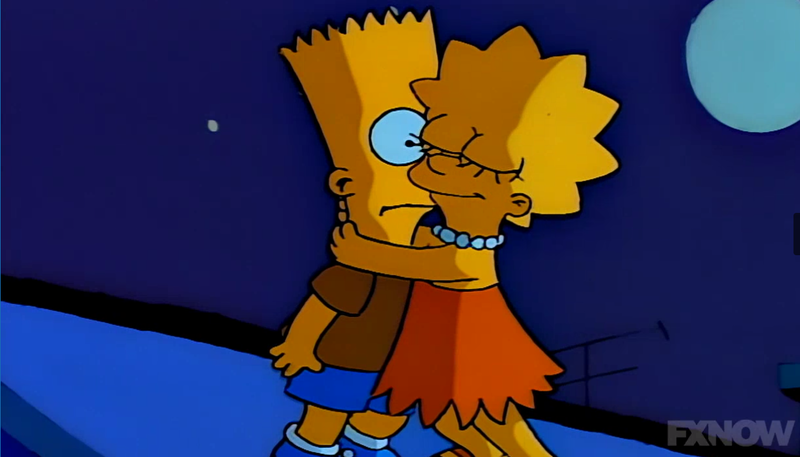 Bart doesn't know so Lisa tells him to look inside himself and if this is really how he wants to treat his sister. Bart realizes what he has done and apologizes. Homer and Marge were listening the whole time and the episode ends with the whole family eating turkey sandwiches in their pajamas at the kitchen table. Homer: "If you make a balloon for every flash-in-the-pan cartoon character you'll turn this thing into a farce." Lisa's centerpiece is really good. Some of the women she mentions is Georgia O'Keeffe, Susan B. Anthony, and Marjory Stoneman Douglas who worked her whole to save the Everglades. Bart is a terrible kitchen helper--can't find cranberry sauce, or the can opener, thinks the can opener is broken so Marge opens the can, doesn't put cranberries in the refrigerator--but I guess most children are bad helpers when it comes to stuff like this. "Hooray for Everything invites you to celebrate the greatest hemisphere of all. The Western Hemisphere!" Patty: "Even a caveman could start a fire." While the battle over the centerpiece is a continuation of the battle for the glue from earlier in the episode, which Lisa says is about territoriality, it's portrayed as very vindictive on Bart's part. He interrupts Lisa's speech with the turkey, refuses to let go of the centerpiece, and ignores Marge's suggestion that they have enough room for both--which I agree with considering Marge has Patty and Selma's trout almondine on the table. Later, when Marge says Bart can come down and eat when he has apologized to Lisa in front of the family, he gets mad and decides to run away. "Apologize for what? Clearing the table? Having a sense of humor?" Bart doesn't understand why everyone is mad at him and even though he is 10, I find that a little hard to believe. I was 8 when I first saw this episode and I understood what Bart had done. The only thing I can think of is, was there ever a time that you did something when you were a kid and it seemed as though everyone got mad at you? And because everyone got mad at you, you skipped over feeling bad about what you had done and just got angry at everyone for being mad at you? I'm guessing that's what the writers were going for but the idea that Bart has no idea why everyone is mad and upset at him is a reach. 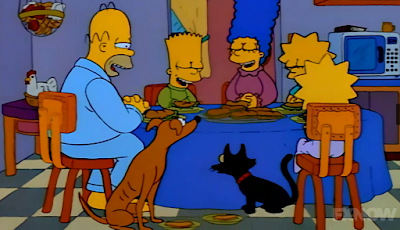 Homer, saying grace: "We'd like to thank you for nuclear power, the cleanest and safest energy source there is. Except for solar, which is just a pipe dream." As Bart runs away, he lands in the flower bed "Uh-oh! I mean, good!" and he starts jumping on the flowers. Mr. Burns lives at the corner of Croesus and Mammon. Croesus was a king in ancient history and Mammon is used in the Bible to mean money. Both are used to indicate wealth and sometimes greed. Burns, after finishing his slice of turkey: "I couldn't possibly have another bite. Dispose of all this." Lisa has an "End Apartheid Now" poster and a biography of Ruth Bader Ginsberg. This episode aired in 1990, three years before her nomination to the United States Supreme Court. Bart crosses the railroad tracks and sells his blood in order to get money: "Twelve bucks and a free cookie. What a country" and he promptly passes out in the gutter. It's amazing how quickly Bart's tune changes from saying "Ha, ha. I didn't apologize" on TV to realizing how living on the street probably isn't his best idea. After learning that Bart ran away, Lisa is in her room, writing in her journal, and blaming herself that Bart is gone because she couldn't "take his abuse with good humor." That's some grim commentary considering Lisa has nothing to apologize for. This is all Bart's fault but it goes to the heart of Lisa where she is the quintessential middle child.